The crazy hot of this Seattle summer is something we all didn’t count on when planning an outdoor wedding this Summer! And over these past weeks, I smile as I look back on the wonderful couples who took the summer heat in stride and worked around the ups and downs of high temperatures, scorching sunshine and warm inside spaces. Gail and Ty (featured in photo) were married at The Manor on Bainbridge Island, surrounded by their dearest family and friends. Gratefully, instead of full sun, we had shade and a bit of a breeze from the water. 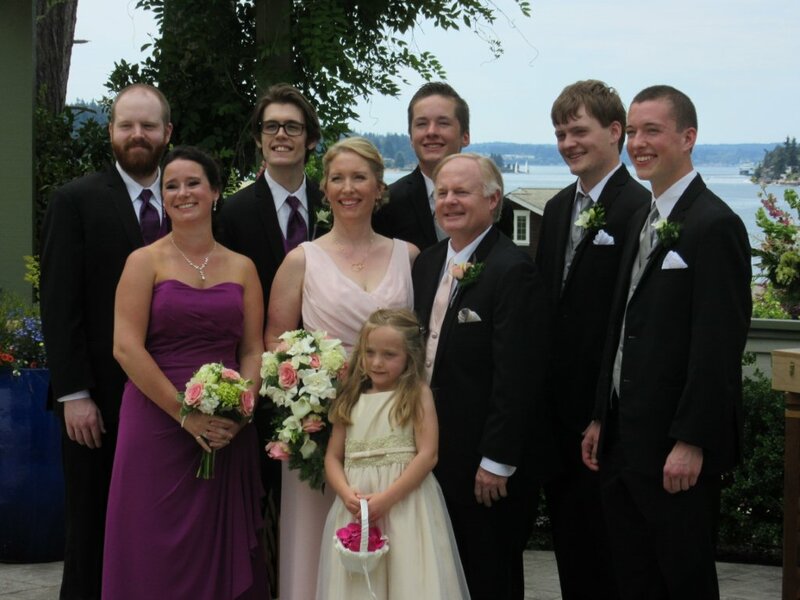 Bob and Stephanie smiled all ceremony long as they were married on the Pier of the Seattle Aquarium. Like Gail and Ty’s wedding, there was a waterside breeze for these two beautiful people and it was such a joyful evening! Mark and Laura pulled together a sweet ceremony and celebration at a park on Alki Beach on a Sunday afternoon. While it was warm, we had a bit of cloud cover that made things more beautiful and easy. Janice and Terry were married in the sunny garden of Volunteer Park and embarked on a honeymoon weekend to Vancouver to see the World Soccer Cup! The very wonderful Johnny and Abby and 80+ of their family and friends ALL traveled from Texas to be married at the Seattle Aquarium on July 3rd…go big or go home! It was a easy and elegant wedding ceremony on the Washington State Ferry on the morning of July 4th for Rodney and Jocelyn and 20+ of their family and friends to be followed by an afternoon reception. Shawn and Paul were married under a willow tree at The Willows Lodge. Sid and Diana were married in an Inter-Faith ceremony under a magical canopy of trees at Twin Willows at Snohomish – complete with an original composition (gift from a friend), the presentation of a necklace in the Hindu tradition and the breaking of the glass. And on a Sunday evening as the 4th of July weekend was winding down, Eugene and Elsa exchanged beautiful vows on the top of the Ballard Hotel – yes, in the sunshine.